Twenty years of refining my artisitc skills, combined with my latest travels has resulted in these new art pieces, and a new technique for me to explore. I was fortunate enough to swim with these graceful giants of the sea, in the remote Indonesian Archapeligo of Raja Ampat. Of all the things I’ve done, this has definitely been a highlight. I’ve combined these memories with my years in the electrical and solar trade to create this new style of sculpture, and I’m still learning better ways of working with this new medium that is so familiar to me. 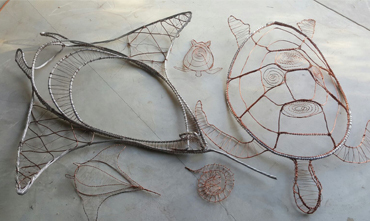 During the creation of these pieces I could see images of skeletons, empty shells, ghosts of these animals. I thought how lucky it is, that my kids got to swim with these magnificent creatures in the wild, and will they still be around for their kids to swim with, or will they fade away to ghosts and google history? All our lives are entwined with the ocean, and I’m often in awe and have great respect for what it provides to us.